Retired Major General Arthur MacArthur (father of General Douglas MacArthur) stood before the 60 surviving members of his old Civil War unit, the 24th Wisconsin Infantry. On the wall behind him was a special flag, aged and battle torn. It was the original battle flag of the 24th Wisconsin. Almost 50 years earlier, as a young Union Lieutenant, MacArthur had valiantly carried that flag up Missionary Ridge. For his heroism that day, he had been awarded the Medal of Honor. On this night as he stood before his comrades, Arthur MacArthur was to give the keynote address. He stood, spoke three words, and collapsed to the floor. With his remaining fellow soldiers gathered around him, Arthur MacArthur drew his last breath. Edwin Parsons, the adjutant for the veterans in the group, looked up from the body of MacArthur to the flag, stood to his feet, and as the minutes of that meeting recorded, "took from the wall the battle-torn flag he (MacArthur) had so gallantly carried, and wrapped it around MacArthur." More than 40 million American men and women have defended freedom in the uniform of our Military Services. The red, white and blue of the American Flag covering their casket upon death, is a final tribute to the men and women who have secured the blessings of liberty. Though the privilege and tribute is not reserved exclusively for veterans (flags also drape the caskets of government officials and others of import), it is a special tribute the family of every veteran should be aware of and take advantage of. The U.S. Department of Veterans Affairs (VA) issues almost a half-million burial flags drape the caskets of deceased veterans each year. Any honorably discharged veteran is entitled to a burial flag which, upon interment, is folded and presented to the family as a keepsake. Only one burial flag may be provided per veteran. Usually these details can be handled by the funeral director, however every veteran, and the family of every veteran, should be aware of this special provision. Appropriately, this is one of the few governmental actions that can be done with a minimum of "red tape" and paperwork. 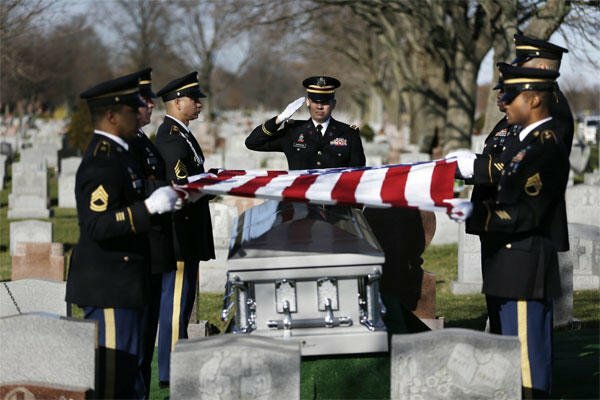 A burial flag may be obtained from most post offices after filling out a simple, single-page form, VA form 2008, and verifying the Veteran's status with discharge papers such as a DD-214. Any veteran of a war, Mexican border service, or of service after January 31, 1955 who was discharged under conditions other than dishonorable. Any veteran released from active duty in the US Armed Forces under conditions other than dishonorable after serving at least one enlistment, or who is discharged for a disability incurred in the line of duty. 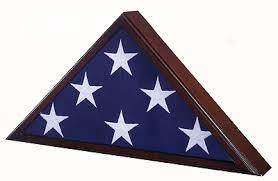 Any Veteran who died in active service after May 27, 1941 and for whom a burial flag has never been issued. a) The phrase "veteran of war" requires a showing that the deceased was in service in the US Armed Forces during a war period. The phrase "Mexican border service" means active service during the period beginning 1/1/1911 to 4/5/1917, in Mexico, on the borders thereof, or in the waters adjacent thereto. The phrase "service after January 31, 1955" relates to veterans with active military, naval, or air service after that date. b) The phrase "under conditions other than dishonorable" requires showing of discharge or release from active duty under honorable conditions (Honorable or General) from the indicated period of service in the US Armed Forces or, in absence of such discharge or release from active duty, A determination by Department of Veterans Affairs that discharge or release from active duty, was under conditions other than dishonorable. c) The phrase "at lease one enlistment" is construed to include service of a commissioned officer whose service, computed from date of entrance into commissioned status to date of separation from service, terminated under honorable conditions, and in all cases, relates to peacetime service before June 27, 1950.
d) When the deceased was honorably discharged for disability, it may be assumed that the disability was "incurred in line of duty". e) Issue of flag in in-service cases is required only when the deceased was interred outside the United States, or remains not recovered, or where service department cannot supply flag in time for burial. An explanation should be included on the VA Form 2008 under "Remarks". The loss of a family member can be a traumatic time, and the Veterans Administration has taken every step to insure the process of procuring a burial flag can be done rather easily. A completed VA Form 2008 can be taken with a copy of the deceased veteran's discharge papers to most VA regional offices or local post offices, where a burial flag will be immediately issued. In the event that you are unable to locate discharge papers, the issuing authority may issue a burial flag without them, provided a "statement is made by a person of established character and reputation that he/she personally knows the deceased" to have qualified under the above criteria. Half Couch - When the casket is displayed in the half-open position, the burial flag is folded into thirds, the outer fold displaying the Union next to the open portion of the casket on the deceased veteran's left. Full Couch - When the casket is displayed in a fully opened position, the burial flag is properly folded into a triangle with only the stars and blue of the Union showing. This folded burial flag is placed in the center of the top portion of the casket cap (lid) just above the left shoulder of the deceased. 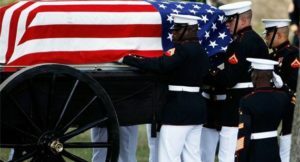 The United States Flag Code specifies that the burial flag should never be allowed to touch the ground, nor is it to be lowered into the ground with the casket. The proper procedure at the conclusion of the graveside ceremony is: The burial flag is lifted waist-high by the pallbearers and held in this position for the playing of "Taps." Upon the conclusion of the playing of "Taps" the flag is properly folded into a triangle. The folded flag is then presented to the deceased veteran's next of kin "On behalf of a grateful Nation." The folded burial flag becomes the property of the Veteran's family, to honor the memory of one who has served the cause of freedom. 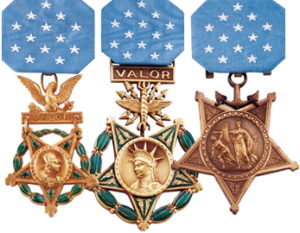 Those who die on active duty or were awarded the Medal of Honor receive, upon request, full military honors including pallbearers, a firing party (for a gun salute), bugler (to play "Taps"), officer or NCO in charge, and a chaplain. Retired military personnel can receive full honors upon request, resources permitting. At the very least, a Service representative will attend the interment service to present the Burial Flag to the Veteran's next of kin. Any honorably discharged Veteran may request a Service Representative to present the Burial Flag to the next of kin, but this will be subject to the resources available in the community. In many communities, with military resources declining to support funeral details, local veterans have formed "burial details" to render proper honors to their deceased comrades. These dedicated teams are independent of official sanction, but are veterans who are concerned with seeing their brothers and sisters in arms properly honored upon death. The level of support they can render varies from community to community, but usually include at the least a "firing team" to render a gun salute, and a representative to present the burial flag. You can contact your local veterans organizations (VFW, American Legion, GI Forum, Marine Corps League, etc.) to learn if such a detail exists in your location.